Does Chat Result in More Good NET LEADS? 50/50 Traffic Split Test across 18 law firm websites over 8 days. The question: How many more NET GOOD LEADS (Not Just Chat Leads) does Live Website Chat Drive to a law firm websites. 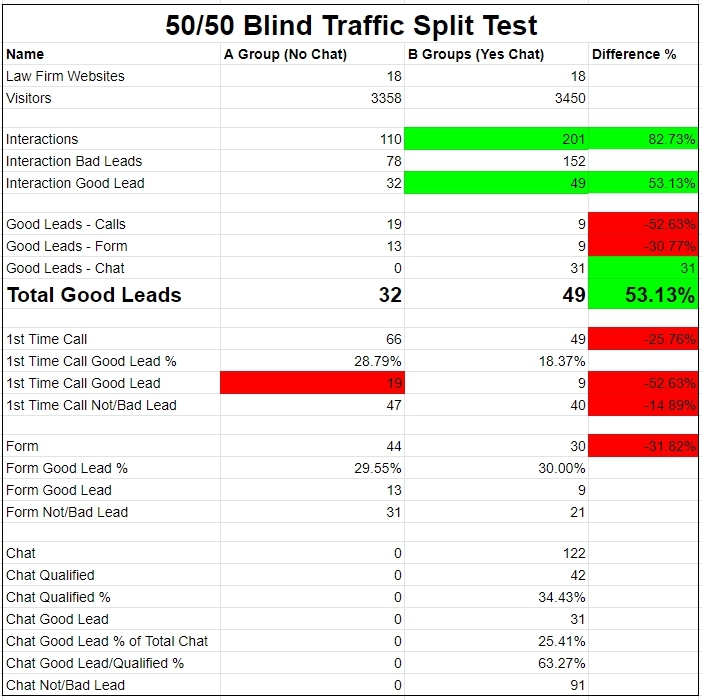 The end result of our A/B Test is that law firms that use Juvo Leads Live Website Chat earned 53% more Good Leads. Good Leads = A good lead is a “helpful” (Juvo in latin) lead. “Good” varies by firm but the definition we all businesses to use is: “A inquiry into your firm from a qualified person/s or business considering hiring your firm.” These leads are manually scored by the firm or the marketing agency managing the firm. How Phone Leads Were Cannibalized by Chat? Great question! We did a detailed analysis but first we need to define terms. Net Good Leads = The total or Net amount of GOOD LEADS (as marked by the firm) coming from Form Submissions, Phone Calls, and Live Website Chats. Bad Lead = A. Calls <45 Seconds (some firm manually review all calls) B. Spam Form Submissions Not Auto Filtered C. Chats not qualified based on firms qualification rules D. All Manually Reviewed as Not A Lead or Bad Lead. Chat Qualified = Juvo Leads Live Website chat qualifies each chat based on the qualification rules as provided by each license holder. Chat Qualified means the chatter met the qualification rules as defined by the law firm the chat was saved and sent to the law firm. Chat Good Lead = A saved chat that meets the firm qualifications rules and is manually marked as a good lead. Juvo Leads Live Website Chat resulted in a 26% reduction in phone calls and a 32% reduction in form submissions – which is significant. Further Juvo Leads Live Website Chat reduced the good leads earned from phone calls by 53% and from Form Submissions by 31%. Both of these reductions are significant, but more than made up for by the NET INCREASE in GOOD LEADS earned. The 18 law firms combined for 32 “Good Leads” in group A (no chat) while group B (Chat On) earned 49 “Good Leads” or an increase of 53% in Net Good Leads even when accounting for the cannibalization of Form Submissions and Calls. Use Juvo Leads Live Website Chat and get 53% more leads! Here is the complete export of lead data from Juvo Leads. The data has been scrubbed to remove client information but you can see all the data that Juvo leads collects (including Gclids). Still Skeptical about Juvo Leads Live Website chat? Try Juvo Leads FREE for 30 days and we’ll run this split test on your website or every one of your clients websites so you can see exactly how many more good leads you earn with Juvo Leads – all for FREE! 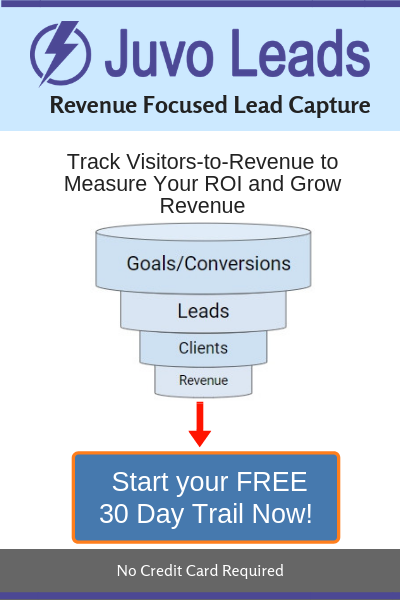 We built Juvo Leads specifically for marketing agencies. Our best in class chat combined with call tracking provides a unique SWAS (software with a service) solution that help marketing agencies stay ahead of the curve.